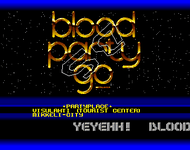 Blood Party 1990 was supposed to be held held at Visulahti (tourist center) in Mikkeli, Finland by the group Bloodsuckers for the Amiga scene. After last minute hassles with the party location that was not secured early enough, party was moved to Kuopio youth center. Entrance was 150fim, and free for anyone not from Finland. About 40 people attended. The invitation intro quoted a date of april 27th until may 1st, but the party report in Fourth Dimension quoted the date we have set. We choose to believe there was a delay. Information and results from party reports in Fourth Dimension 3 (july 1990) and Zine 6 (august 1990).